Taking a break from writing because I just reached 18,000 words. How does my family feel about me after one week in NaNo? 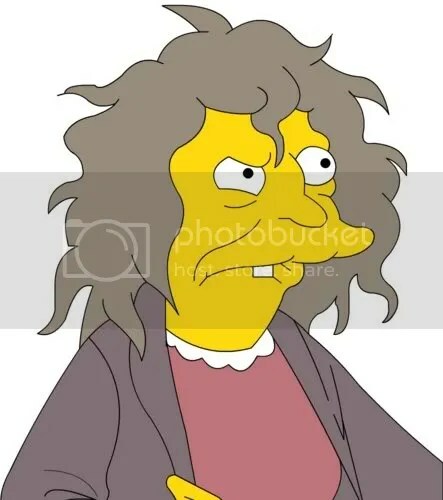 I’ve officially been compared to the crazy cat lady from The Simpsons. Considering the goofy things I’ve been doing the past couple days, I can’t really argue with them. I seem to be losing all common sense and any attention to detail. I can’t comprehend what people are saying to me and have to ask them to repeat it two or three times. Where will I be after three and a half more weeks? One other thing I didn’t expect going in is that I’d be such a hermit writer. Originally, I intended to seek out fellow NaNo writers as a support line throughout the contest. Was even going to hook up with some local writers and go to our Denver launch party (but only until I found out it was way past my bedtime). None of that happened, although R.J. informed me he joined the contest a few days in and he and I have chatted about our progress. Now it’s back to writing. I’m going to try to get to 20,000 today. Anybody else in the contest out there feeling like me? Exactly like that. I was telling my wife today that I wished I had time to spend interacting with all the NanoWrimo participants. Just haven't had the time and like you, my goal was 20k for the first week. Hit 21k this morning so I'm thrilled, but doing it alone. Wow! Sounds like you are doing great. I was proud of my 11,500K until I read your post!I too, am a solitary writer (you get more done that way!). Be proud, Marissa. At that rate you'll have a novel in no time. Awesome, Larry! I pooped out last night at and fell asleep by 8:00 P.M. Didn't make it to 20,000 until this morning. YAY, Marisa! And you were so worried. You're so right about getting more done when you just stay focused on writing.